Hello! Just getting an update in between all of the insanity going on in my life right now. Between finishing up senior year, college planning,scholarship applications, work, and of coarse, Cora, my life has been a little taste of every sort of crazy. But rest assured, things have been getting done, and I’m right here to tell you all about it! Let’s start with Cora progress! Unfortunately, because of all of the insanity, my dad and I have not been able to put a whole lot of work into Cora. 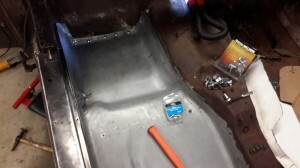 We are about half way done with the driver’s side floor pan. Hopefully I’ll get to get some more welding practice in. For now though since I’ve had relatively no practice, I shall have to be content with welding a smiley face on a spare sheet of metal. Because of how arduous these floor pans have been, lets just say that I shall be quite happy when they are done and over with. My dad can verify that grinding and cutting is not exactly my favorite thing. We’re getting close! We only need to weld in the new corner, drill out one rivet hole, and then begin the final installation. N.B. – Do not mount the rivets as shown in the photo; I was only using the rivets to position the floor pan. The rivet head has to be on the fiberglass side! Since there has not been a huge amount of work done on Cora lately, I shall have to move on to a different and more progressive topic. I am ecstatic to report that I have been accepted into Kettering University. For those of you who don’t know, Kettering University is a small school in Flint, Michigan that is famous for it’s involvement in the automotive industry. Formerly known as General Motors Institute, many “greats” in the automotive industry such as Mary Barra, who is General Motor’s current CEO, are Kettering alumni. At Kettering, I will be pursuing a degree in mechanical engineering, with a minor in business administration. It is a “year round” school. I will explain to you in a post this weekend how that will work and how Cora will fit into it all. Also, does anybody know any scholarships that I could apply for? I have a 3.5 GPA, and a 24 on the ACT. I will need all of the financial help that I can get. Lastly, I want to let you guys know ahead of time that my dad and I are planning on going on a Route 66 trip this summer in June. Sadly, because Cora will not be finished by then, it will most likely be in a rental car. However, I won’t hesitate to keep up with the blog posts telling you guys about everything my dad and I stumble upon with the trip. We are considering this our “practice” trip so that when we do go in Cora, we’ll get everything right! Thank you guys for reading even though I have definitely not been the best at keeping you guys posted on what is going on. Thanks, everyone for all of the help and support from this proud Kettering bulldog! This entry was posted in General by JackieW. Bookmark the permalink. A quick floor pan update!